Council taxpayers in Horncastle may have to fund the maintenance of a new bus shelter - even though it is claimed developers of a nearby housing estate could ‘walk away’ with a £6m profit. 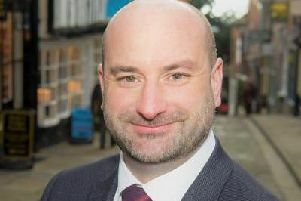 The provision for two new bus shelters on Lincoln Road was one of the planning conditions laid down by a Government inspector in connection with a controversial decision to give the go-ahead to a new housing estate on Langton Hill. The scheme was initially rejected by East Lindsey District Council, and attracted widespread local opposition. At the time, the developers were Gladman, although work on the 300-home estate has begun by Cyden Homes. At a town council meeting last Tuesday, it emerged only one of the two proposed shelters can be built - because there is not enough room for a second structure. Councillors heard that while developers would cover the cost of erecting the shelter, neither they nor Lincolnshire County Council were prepared to take on the financial implications of maintaining it. Instead, the town council has been asked to cover the costs . It was claimed at the meeting that unless the council agreed to pay, the shelter might not be built. He said: “Are we actually saying they (the developers) can’t find a couple of hundred pounds a year to maintain the shelter, while they walk away with a £6m profit (from the new homes)? Coun Wilkinson was backed by Coun Maurice Lamb. They both called for planning officers at ELDC to enforce all 20 of the conditions connected to the Langton Hill development - including the new shelter. Coun Lamb said: “Developers are walking into this town, doing whatever they want, and expecting us to pick up the pieces. Council chairman Coun Brian Burbidge said some of the other 20 conditions laid down by the inspector had been wavered. He pointed out that a ‘number’ of residents had backed the idea of new bus shelters on ELDC’s planning portal. He said: “We have a responsibility to those residents. Councillors were split 5-5 on a vote about paying for the maintenance. Coun Burbidge used his casting vote in favour, although councillors agreed they would only proceed - if the developers made a ‘commuted’ contribution. They also agreed to write to ELDC about the issue of enforcing planning conditions.